Despite the simple hotel, the view is pretty good. 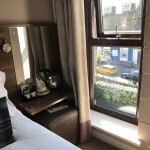 If you’re planning to visit Loch Lomond and head to Glencoe thereafter, the Loch Long Hotel in Arrochar Scotland is probably one of the best options, in terms of value, location and convenience. 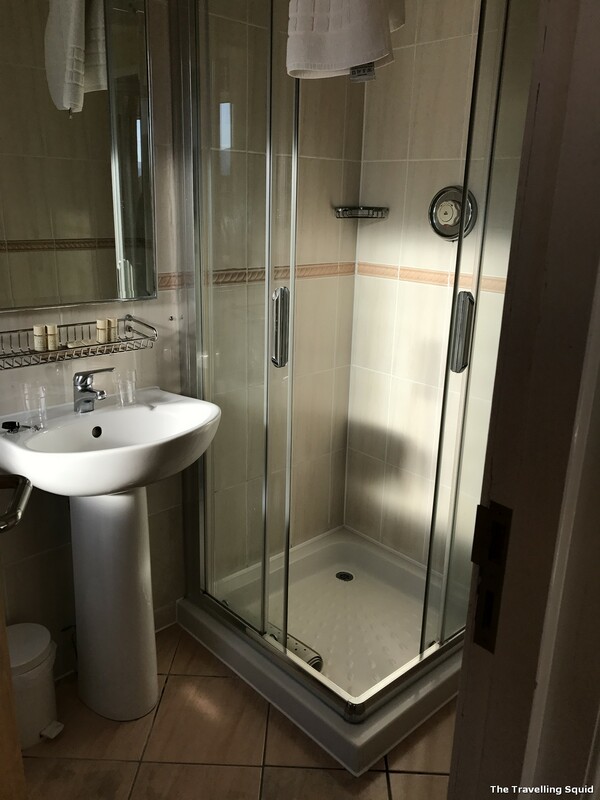 I see it as a three-star hotel – but comfortable enough if you’re not too fussy about the tricky hot water shower function, and rather thin walls. We could listen to the live music which was on-going as an evening entertainment for guests – it’s not really the genre of music we typically listen to, but it was soothing and soon we fell asleep. The weather helped too. There’s no air-con – but it was cool enough with just a slight opening of the window. Hotel carpark with a dearth of parking lots based on the number of rooms. 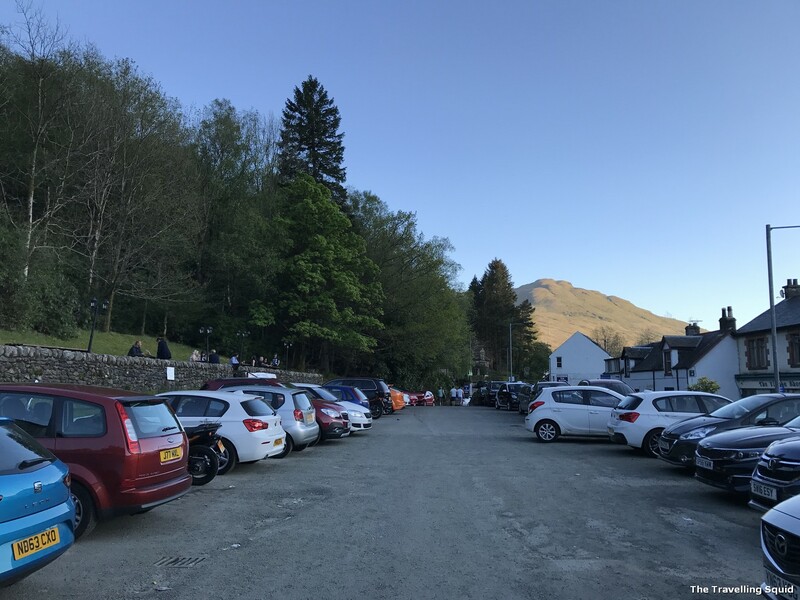 There’s a public carpark a 5 minute walk away from the hotel, near the Loch Long. 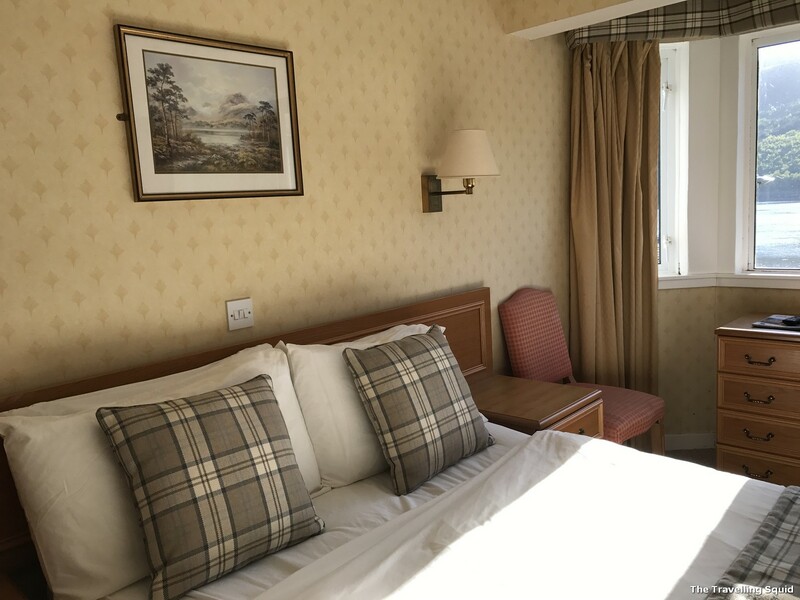 Our first experience with the Loch Long Hotel in Arrochar Scotland was not great. First, there wasn’t sufficient parking lots and S attempted to do a parallel parking. That involved the car coming into contact with a wall leading to the staircase and that left a scratch. After looping for several times around, we eventually stopped, and I learnt from the hotel receptionist that there was public parking, free of charge in the evening, just a five-minute walk away. A decent lobby I guess. No lifts at every floor for heavy suitcases. We were place on the fifth floor. Let’s just say this hotel isn’t suitcase-friendly. 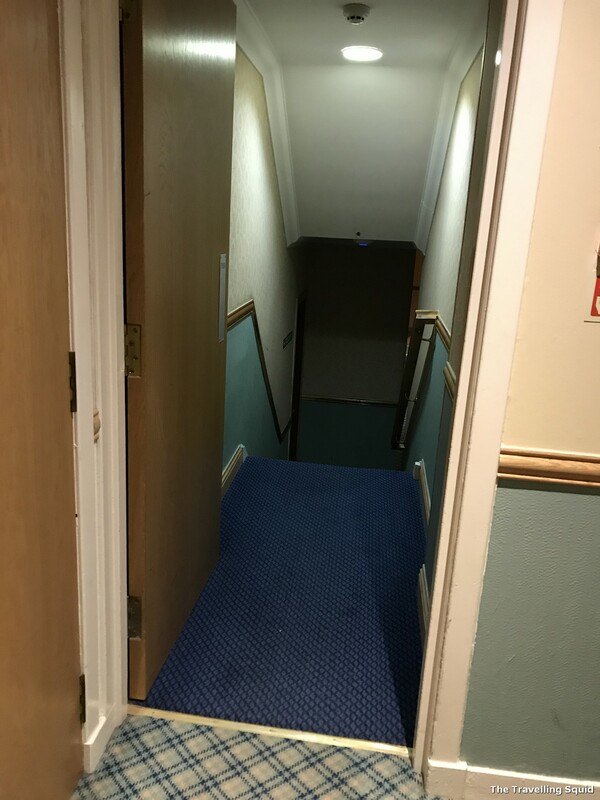 Through our travels through Scotland, having lifts that stop at every floor, or lifts in the hotel is not the norm it seems. One must not take that for granted. 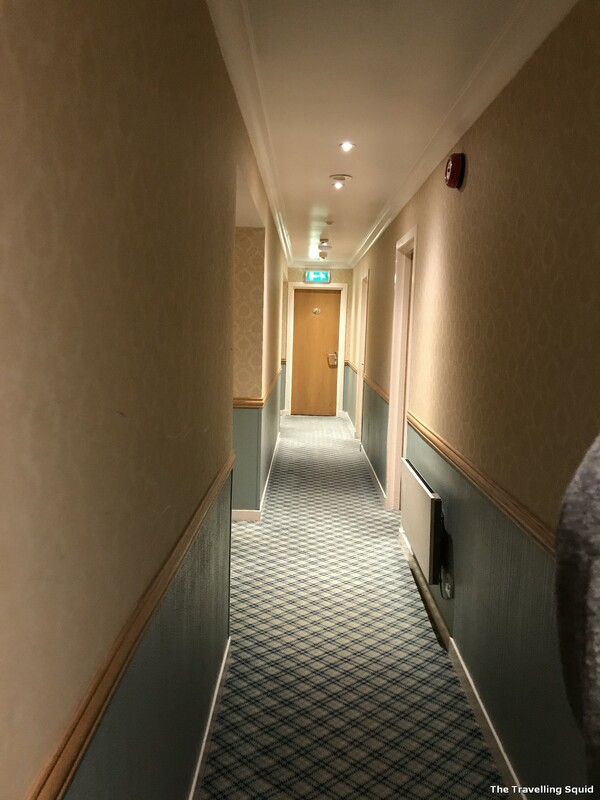 The building is made of a maze of different steps, and we had to take a detour to take the lift to the third floor of another part of the building, then drag it along some corridors, steps, corridors, steps and finally get to the room. That was quite exhausting for S, who had to help me with my luggage. The bed was comfy enough. The room was dated, but had a fantastic view. 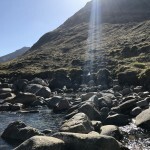 with the sun streaming in on a Scottish summer’s day, the light reflected for the water of Loch Long – which was serene and beautiful. It was nice that daylight hours were extended during summer, and the view lasted for a long while. 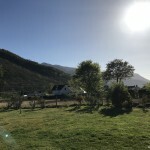 Arrochar is a very quiet town, and once the sun goes down, all that is left of the view around is a smattering of lights in the distance. We thought it would be a quiet evening, but as mentioned in the first para, the hotel had some night entertainment for its guests. The room was otherwise quite clean and the bed was comfortable. With the price tag of SGD150 / £86, it was pretty affordable especially as there was complimentary breakfast. The bathroom looks quite nice with the sunlight streaming in. The toilet was clean, hot water function of the shower was hard to figure out. It took a while for the hot water to come. The breakfast was decent. You get an ala-carte option, and could choose from a shared corner of items, such as cereals and toasts as well. The hotel asks that you register for specific slots, such that it isn’t too congested during specific periods of time. 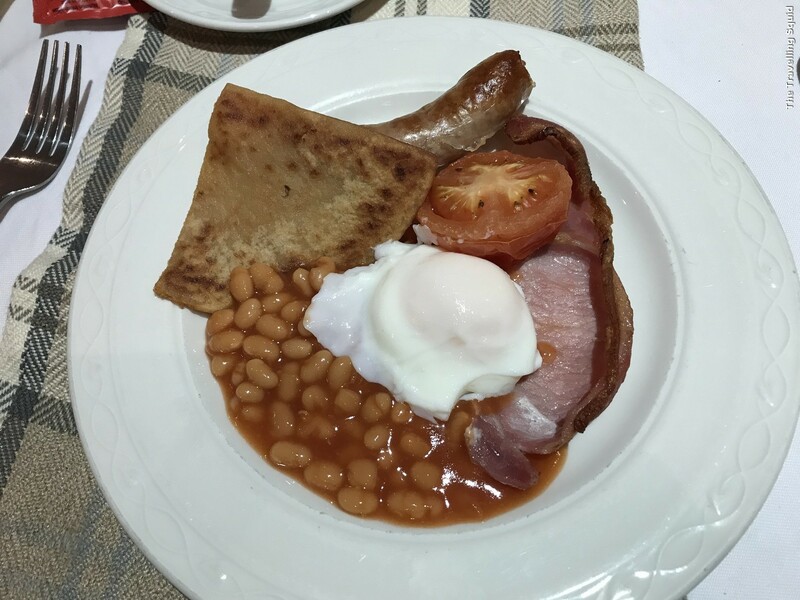 The Loch Long Hotel ala-carte breakfast. 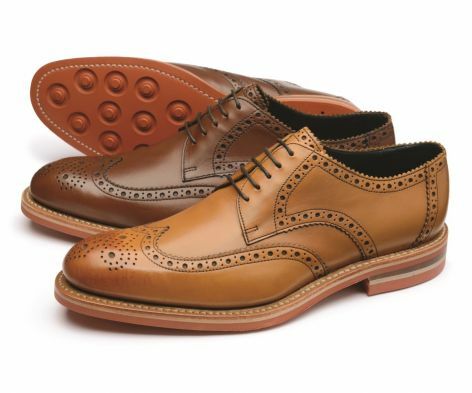 Decent, standard fare. 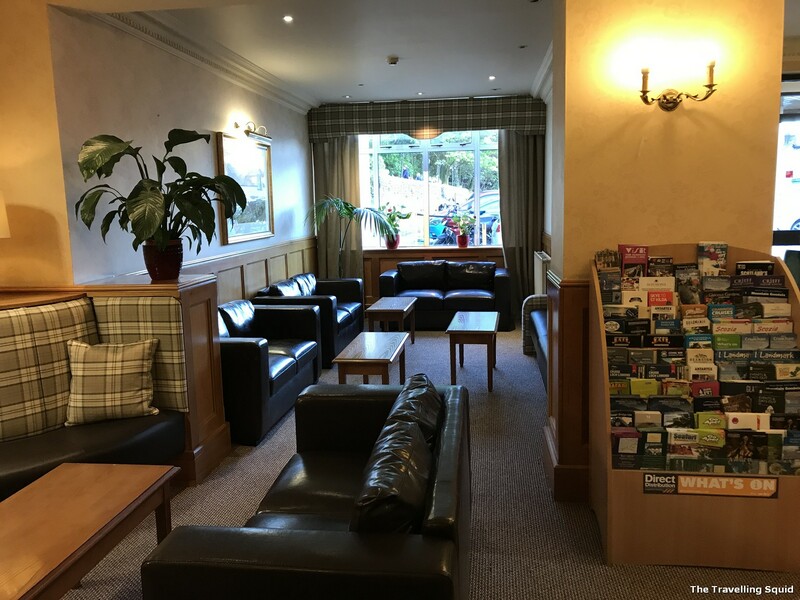 The Loch Long Hotel in Arrochar Scotland was a value for money place to spend the night, especially on our way up north to Glencoe from Loch Lomond. 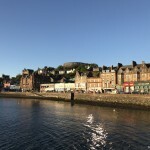 In all fairness, I think it is worth the price, is just that we had some trouble with parking and lugging our whisky-laden suitcases up the steps. If you’re concern about the lack of night activities, the hotel had a live singer who sang songs from the 80s. You don’t really have to buy a drink, could enjoy the singing for the comfort of your bed cos it’s easily audible. 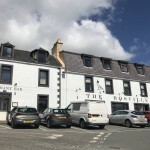 I will be sharing more about a pub in the vicinity, and the story of the lady who demanded compensation from Loch Long Hotel. Stay tuned! 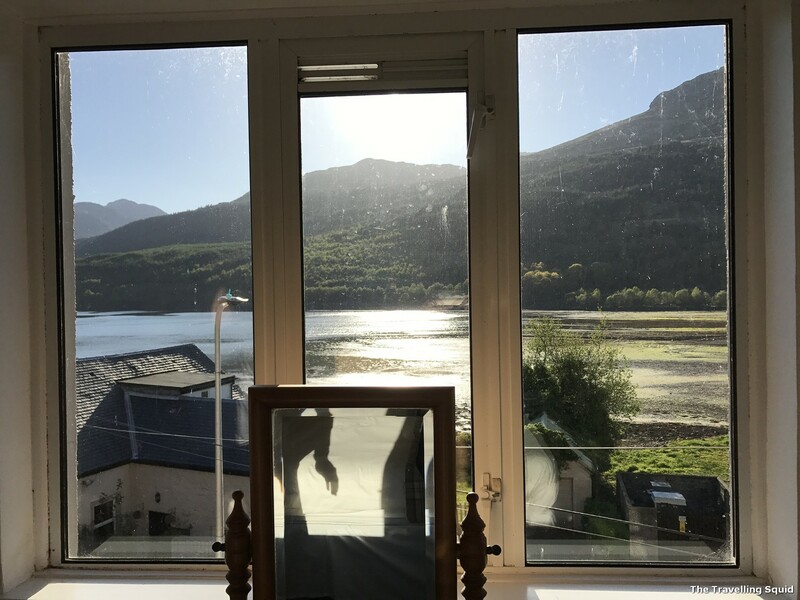 One Response to "Review: The Loch Long Hotel in Arrochar Scotland"